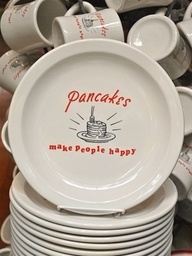 Jungle Red Writers: Pancakes Make People Happy! ROSEMARY HARRIS: Back in the 80's there was a restaurant in NYC called Pancakes Make People Happy. In celebration of National Pancake Day (yes, there is a national day for everything) we're going to put aside nutritional and caloric concerns and indulge ourselves today! The owner, Jane, and Lizandra and the other waitresses have welcomed me and we've all been featured numerous times in local papers about Mysterious Doings in our town. It's all great fun and I've even had a few Coffee and Crime events there. But I feared I was disappointing them with a steady diet of two eggs, scrambled well, sliced tomatoes instead of potatoes. Where's the fun in that? Hubby is chowing down on the Lakeside Special (a little bit of just about every breakfast food) AND a donut and I'm left wondering what's wrong with this picture? One day a diner at a nearby table ordered something that made my standard meal seem as appealing as a bowl of cold gruel -- Jane's Red, White and Blue Pancakes. Frisbee-sized pancakes covered with a mountain of sliced strawberries and blueberries and topped with a dusting of powdered sugar. Whipped cream optional. It was enough to make me want to fling my eggs into the lake. HALLIE EPHRON: Ah, breakfast, one of my favorite topics. For me it's waffles, not pancakes. And they've got to be homemade (Bisquick), hot off the griddle, really crisp, with unsalted butter and real maple syrup. It doesn't get much better than that. HANK PHILLIPPI RYAN: Um. I love breakfast, too, but I don't like pancakes. I think they're gluey and taste like paste. The THEORY of pancakes is good, and the theory of waffles, too. But I'm not...drawn to them. Scrambled eggs with cheese and bacon? Yes, ma'am, yummeroo. Or just the bacon. I LOVE BACON. Just saying. I also make gallettes--which is oat bran, eggwhites and lemon yogurt, fried like a pancake. DELISH, topped with lemon yogurt and raspberries. Now my husband has become famous for Bapa's crepes in our family. He makes them whenever the grandkids stay over. Thin, thin crepes made with lots of butter. I often stuff them with strawberries then drizzle with maple syrup and a dob of whipped cream. Heaven. And Hank, I love bacon too. We treat ourselves every Sunday to a full English breakfast,but not the fried bread--that's bread fried in the bacon fat--too much cholesterol suicide! Rhys, my church is doing a Shrove Tuesday pancake supper next week. That, and our every-other-month pancake breakfasts, are fundraisers for the youth group. We always get a big turnout, which leads me to suspect that most people LIKE pancakes; they're just intimidated about cooking them at home. LUCY BURDETTE: If I'm going to order pancakes, I like them to be buckwheat blueberry with real maple syrup. But my sister makes a wonderful pancake with cottage cheese and nuts, topped with plain yogurt and maple syrup. It tastes much better than it might sound. In fact I'm going to make some for dinner this week:). thanks for the idea Ro! DEBORAH CROMBIE: I love waffles and pancakes. For the waffles I usually use Arrowhead Mills Multi-grain Pancake Mix, but pancakes I make from scratch, with whole wheat flour and buttermilk (recipe from my old Laurel's Kitchen book.) I don't like white-flour pancakes; I agree with Hank that they taste like glue. In the summer I put fresh blueberries in my pancakes (Rick doesn't like them. I ask you, how can anyone NOT like blueberry pancakes?) and I use unsalted butter and real maple syrup. ROSEMARY: They are not something I order every week, but dang if they don't MAKE ME HAPPY! So 'fess up. Do you have a favorite pancake dish? One you make or order out? Cranberries? Chocolate chips? Navaho pancakes? What's your pleasure? Ah, the joys of real breakfast foods --- which we have been known to have for dinner . . . bacon [yes, always, but we get uncured bacon that has no nitrates or nitrites], soft scrambled eggs [with cheese, yum], made from scratch fried potatoes with sweet onion and peppers . . . . I am generally pretty ambivalent about pancakes, but blueberry pancakes with lots and lots of blueberries and homemade blueberry maple syrup always get my vote . . . likewise the chocolate chip pancakes that are another favorite around our house . . . . The old Joy of Cooking has a wonderful recipe for yellow cornmeal waffles with bacon cooked right into the waffle . . . serve with maple syrup . . . heavenly! Waffles were my late husband's specialty, but give me pancakes when I'm craving carbs at breakfast (or breakfast-for-dinner). When I was a little kid I lived in Rolla, MO, and my grandparents lived in Springfield, MO. Halfway between was Lebanon, and sometimes my parents would drive us down to meet Grandpa Jack and Grandma Sherrell for Saturday breakfast at the Munger Moss Motel in Lebanon. They served silver dollar pancakes--little ones, just the right size for kids. Little did I know then I was dining at at Route 66 legend. Julia, thank you for reminding me about Jordan's blueberry pancakes. They're wonderful and they're on the list of things I want to do in Maine this summer. For 20 years I made whole wheat pancakes every Sunday morning, and my daughter and her husband make them still on Sundays (although with Bisquick). My grandson thinks everyone "in the world" eats pancakes on Sundays! My husband uses a waffle maker his mother bought in the 50's, and which we have had since we got married in 1982. Steve replaced the cord about 20 years ago, and it still makes the best waffles. But I'm not a fan, so he switched his buttermilk waffle recipe up to make whole wheat pancakes. Hank, you would love them. Light, fluffy, delish. And now I'm on a no-wheat diet and can't have them. Rats. I'm with Debs - white pancakes are awful. I've been making whole-wheat pancakes for decades from the Tassajara Bread Book recipe. Used to slice bananas into them and add a few chopped walnuts, but now mostly I add blueberries, either fresh in season or frozen from my annual pick-your-own excursion. With plain yogurt and real maple syrup (some add butter) they are heavenly and you can get through the morning without that white-carbo crash. Oh lordy, am I hungry now. I love breakfast. Breakfast for breakfast, breakfast for dinner. It's all good. And Deb, don't be surprised if a few of us show up at your doorstep next Sunday. That french toast sounds delish! Going to see what I can find here to eat around the office. Nothing as good as this stuff I'm sure. Gigi, I love the image of the family meeting for pancakes at the Munger Moss Motel. There's a story there...are you writing it?? BTW...the red, white and blue pancakes in that pic..had those exact pancakes for lunch last Saturday. I think there was one squashed blueberry remaining on the plate when I finished. Gigi, have you seen the PBS show of Billy Connelly riding a big ole hog motorcycle on Route 66? I just caught it the other night. I wonder if he stopped there? Hallie, Mix a 1/2 tsp. of cardamom into the dry Bisquick. Change nothing else. You'll see. Mmmm. Cardamom in pancakes. What a great idea! We bought 10 lbs. of Maine blueberries last August as we were winding up our vacation Downeast and have been parceling them out to ourselves all winter in smoothies and pancakes. Oh, now I'm hungry. I love pancakes, especially the Bisquick ones w/the lemon juice and tsp of sugar. Light, fluffy (not gluey, honest! ), served with only real maple syrup (I live in New England--fake syrup is a travesty!). And bacon. Yes, I'm with Hank, on that. Yum! We often have breakfast for dinner, especially when I've planned poorly or the munchkin has too much homework requiring parental supervision. Pancakes do make me happy! Mary Moody: Cardamon? Really! And you know, it's the one spice I do not own. It's going on my shopping list right now. I'm a big bisquick fan. Biscuits, waffles, pancakes, crepes. NOBODY MENTIONED CREPES! That's the pancake for the person who thinks pancakes are doughy. And sopapillas! They're a good reason to move to the southwest. Can you tell I haven't had breakfast yet? I was going to make pancakes this morning but ran out of time. I'm now inspired to make them tomorrow morning. In 2010, I quit eating gluten and dairy. That meant saying adios to my Uncle Bo's fluffy, tasty buttermilk pancakes. I've tried various gluten-free, dairy-free mixes. Because I've also quit eating white potatoes, I've settled on the Namaste brand pancake and waffle mix. BUT I've seriously modified it by adding pumpkin pie spice, sugar, and baking powder and using almond milk instead of water. My sons will eat these modified pancakes, so they must not be too bad. I could eat breakfast food for every meal if I let myself. I am a fan of pancakes but I'm getting much pickier as I get older. My newest favorite - buckwheat pumpkin with pecans in the batter. Divine! There's a diner in Chapel Hill - Elmos - that also does a wonderful sweet potato pancake. I can eat them and feel virtuous for adding lycopene to breakfast. Popovers popovers! We used to make them, growing up, and I was always so AMAZED how they worked. KAren, I'm showing up at YOUR door. And Karen, you remind me--my Gramma Minnie used to make pancakes for us on Sunday mornings..little tiny ones, and sometimes, in the shape of our initials. Aww. HI, Gramma. Hank, you're welcome any time. Just call ahead. I am going to have to try the Cardamom, I have some and never know what to do with it. But the only pancakes I make (outside of just trying Hank's gallates) are Polish pancakes. They are basically crepes, the thinner the better, served with butter and cinnamon sugar. Both pancakes & waffles send my blood sugar swirling, so not for me, thanks -- although I do love the Buffalo Cafe's special of one slice French toast with an egg and bacon, and Hank's galletes sound great too. BUT a story: not until I was grown and on my own did I realize that when my mother made "breakfast for dinner" -- pancakes and sausage -- for us kids, it was because she needed a little comfort herself. So I gave a similar ritual to Fresca, mother of my protagonist, in the new series. Hank, any special brand of lemon yogurt? Well, Karen, I used to use Stonyfield farms, but they discusontinued it--far as I can tell, LAST WEEK. Grr. But I have used fat-free lemon greek yogurt, too, and it works pretty well..although the galettes are a tiny tiny bit heavier. I may try Stonyfield Farm fat-free plain, and add cinnamon. And maybe a little splenda. I bet that would work. Ooh, now I am HUNGRY! It's funny, I'm a bit like Hank--never been a huge pancake person. I think because I grew up with a mom who made them 100% homemade (not Bisquick) with whole wheat flour, wheat germ, half the sugar, blueberries (which I didn't like at the time) -- you get it -- and THEN, to make it worse -- only allowed us apple butter (no syrup!). Gack. However, that said, not long ago, I ate a breakfast place with griddles on the tables! Yes! And all kinds of batters, from gluten-free to vegan, and all kinds of toppings, from sweet to savory. Now that was fun. Hank, can you provide your gallette recipe? Sounds delish plus healthy. Hank, could you mix a little lemon extract into the plain yogurt? Bet that would work. MMMMM... Why am I suddenly hungry? I think it might be a breakfast for dinner kind of night! For many, many years I kept sourdough going and made sourdough biscuits or sourdough pancakes every morning (think thin, like crepes or blintzes, and small, like silver dollars, and very, very tender). Sometimes if one of the kids is visiting, they'll ask for them, and I'll explain that you don't do sourdough at the last minute. It takes days to develop. I love breakfast. We often eat it for other meals, as well. Omelets, scrambled eggs, sausage, bacon, waffles, pancakes, blintzes, crepes, French toast, baked eggs, strata, frittata. Above all, I love fried cornmeal mush or scrapple. (Scrapple has sausage in it while the mush is plain.) Slice and saute it in butter after chilling in the fridge all night. Serve golden brown with maple syrup. Yum! And mashed potato pancakes. Chilled overnight leftover mashed potatoes with a little egg and flour, fried in patties till golden and serve with butter. Also great made with leftover sweet potatoes. Delish! Fresh homemade flour tortillas hot from the placa, folded with butter melting inside (or cheese if you want to get fancy). Or just plain with huevos con chorizo to scoop up the scrambled-egg mixture with instead of a fork. (I make my own chorizo to keep it low-fat. It's easy.) Or fresh corn tortillas and huevos rancheros. Then, there's the ultimate. Frybread! Nothing tastes as good as frybread straight from the stove with eggs and bacon. My non-Indian grandmother made a similar recipe from the Depression called snobdodgers and topped with powdered sugar icing with maple extract in it. The best (and much healthier) doughnuts. Now, I'm hungry, but fortunately, I've got spaghetti sauce from scratch going in the kitchen. Only, my mouth's all set for breakfast. Wah! When's Ross going to start making waffles? I'm told he has a professional-grade waffle iron! I miss the Pig N Whistle Diner in Brighton. Bacon waffles, Hank. Just sayin'. I think the name of the restaurant was The Royal Canadian Pancake House. They had a neon sign in the window said "Pancakes make people happy" which was also printed on the coffee mugs. Such good coffee and pancakes the size of manhole covers.